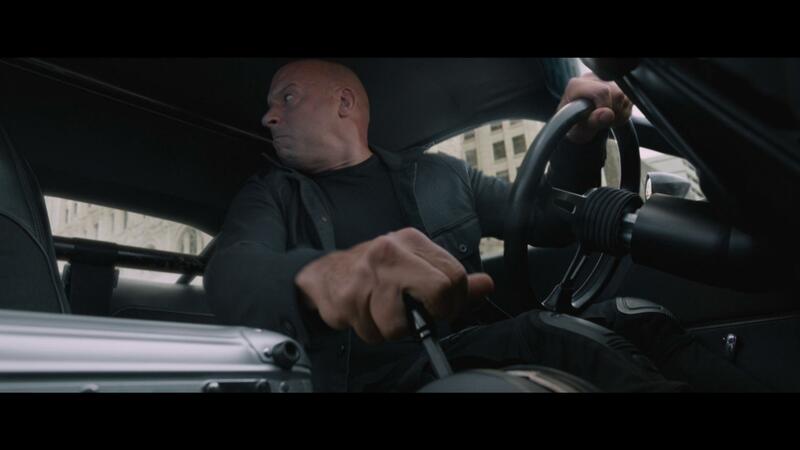 The Fate Of The Furious - 4K UHD Review - ReDVDit! The Fate of the Furious (or otherwise known as Fast & Furious 8, Fast 8, and often stylized as F8) is a 2017 American action film that was directed by F. Gary Gray and written by Chris Morgan. Serving as the eighth installment in ” The Fast and the Furious” franchise, the film stars Vin Diesel, Dwayne Johnson, Jason Statham, Michelle Rodriguez, Tyrese Gibson, Chris “Ludacris” Bridges, Scott Eastwood, Nathalie Emmanuel, Elsa Pataky, Kurt Russell and Charlize Theron. 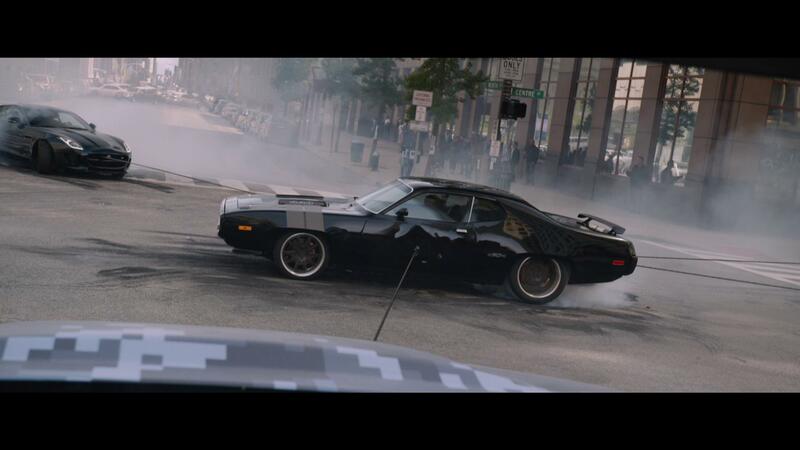 The film follows Dominic Toretto (Vin Diesel), who has finally settled down with his life Letty (Rodriguez), until cyberterrorist Cipher (Theron) coerces him to work for her and turn him against his tram, forcing them to find Dom. This film marks the first installment of the franchise since The Fast and the Furious: Tokyo Drift (2006) not to star both Paul Walker, who unfortunately passed away in a single-vehicle crash on November 30, 2013, and Jordana Brewster. Following script rewrites to the seventh installment after Walker’s death which completed the story arcs for both of their characters, both characters were retired. Plans for the eighth installment were first announced on March 2015 when Diesel appeared on Jimmy Kimmel Live! and announced that the film would be set in New York City. 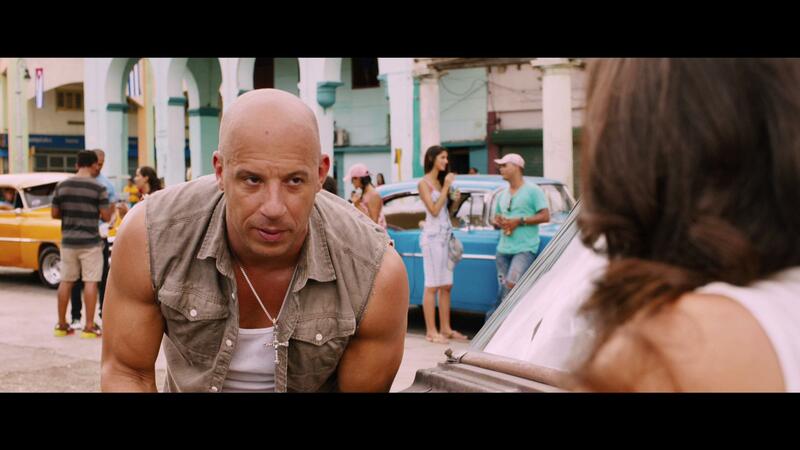 Preparations for the film began immediately after the release of Furious 7. After setting an initial release date in the same month, casting took place between April and June 2015. In October 2015, it was announced that Gray was to direct the film, taking the place of James Wan, who had directed the previous installment. Principal photography began in March 2016 in locations such as Myvatn, Havana, Atlanta, Cleveland, and New York City, continuing the franchise’s tradition of film in exotic locations around the world. Making its initial premier on April 4, 2017 in Berlin, and was theatrically released in the US on April 14, 2017, playing in 3D, IMAX 3D, and 4DX internationally. The film received mixed reviews from critics, who praised the action sequences and performances from the cast, while leaving more criticizing leaning to the storyline. The film had grossed over $1.2 billion worldwide, making it the thirtieth film (and the second in the franchise, after Furious 7) to gross over $1 bullion, the second highest grossing film of 2017 and the eleventh highest grossing film of all time. The film grossed $532 million worldwide during its opening weekend, setting the record for the highest-grossing opening of all time, ahead of Star Wars: The Force Awakens ($529 million). A sequel is scheduled to be released on April 19, 2019. I, like many other people have enjoyed watching the films of the Fast and Furious film series. Those of us treat these films as more of a guilty pleasure more than anything. 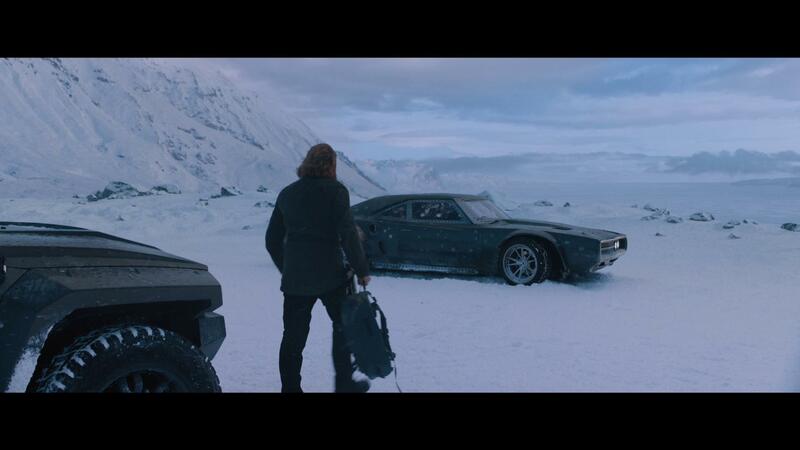 However after the announcement of The Fate of the Furious, I wasn’t too sure on whether or not I’d really like it considering how they left the end of the previous film off. The storyline of this film is something that feels as it was a money grab given the name that the franchise has built over the years and wasn’t thought out too much. Sure, the film is chock full of the mindless action and crazy driving that we’ve all grown to love – but this film really lacked in the story. Watching through The Fate of the Furious, this film really does a fantastic job with its 4K UHD release. Giving a really nice boost of colors with its use of HDR, and maintaining a solid picture presentation throughout all of the crazy action sequences; this movie really does a great job with its visual presentation. With the HDR at play, home audiences with the technology and have been watching the franchise throughout the years, you’ll really enjoy the presentation that’s offered with this release. Packaged with a DTS:X audio track, The Fate and the Furious really slammed through my home theater system. Giving audiences a clean distinct audible presentation, those who have the capability to make use of the technology will definitely appreciate the overall immersive experience that’s offered with the 4K UHD release. 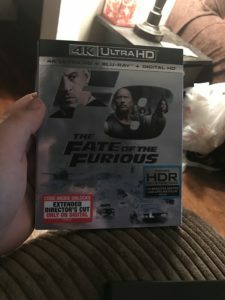 The Fate of the Furious comes packaged in your typical 4K UHD amaray case. Contained within that case is the standard 4K copy of the film, the standard Blu-ray copy of the film as well as the digital copy redemption pamphlet. The 4K UHD disc does feature a piece of artwork that is relative to the film, while the Blu-ray disc doesn’t really have any kind of art on it whatsoever and is considerably plain. 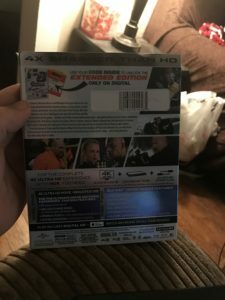 The package does boast the ability to view the Extended Director’s Cut, however that cut is only available using the included digital copy redemption pamphlet. There is also a slipcover that’s been made available during the initial pressing of this release that features similar artwork to the case art. 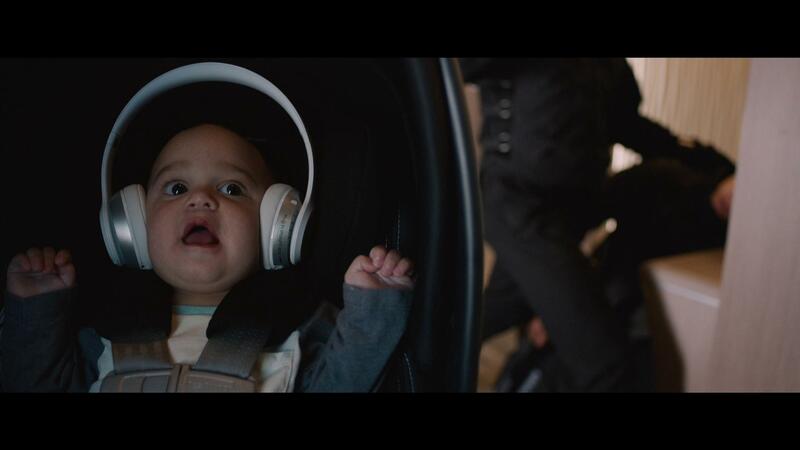 Overall, The Fate of the Furious wasn’t a horrible movie. I mean, films like this are definitely something that I would call a guilty pleasure. The provided storyline of this film definitely had that cash grab feel because, personally speaking, the way that the previous film ended should’ve been an end to the franchise. The overall audio and video presentation of the 4K UHD release are beyond words stellar and the film does an absolutely fantastic job at making use of all of the associated technologies to offer an all out immersive experience for viewers. There is a decent amount of additional content that’s been made available for others to explore more into the film. If you’re looking to grab this film, I’d only really recommend it as a means of continuing your personal collection of the films or if you are planning on grabbing the previous films as this is more of a “you might as well” scenario.